© SeaCo Foods International, Inc.
Good Catch Foods have received $8.7 million in capital funding led by its founder, New Crop Capital, and a syndicate of investors, including PHW Group, Thrive Market, Fresh Direct, Stray Dog Capital, Clear Current Capital, VegInvest, Rocana Capital, Blue Horizon, EverHope Capital, Baleine & Bjorn Capital, M13 and Starlight Ventures. The company are based in Newton, Pennsylvania and use a special “six-bean blend” of pea, soy, chickpea, lentil, fava, and navy beans to create their fish-like food products such as fish-free tuna, crab-free cakes and fish-free sliders. 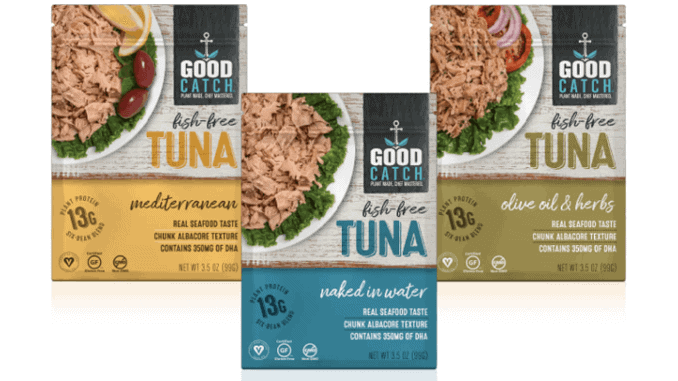 Good Catch’s mission is to “Preserve the ocean’s natural resources while introducing awesomely delicious “seafood” choices that benefit you and the world.” They will be helped enormously in this sustainability mission by this round of investment by investors all interested in helping save the ocean’s ecosystem.